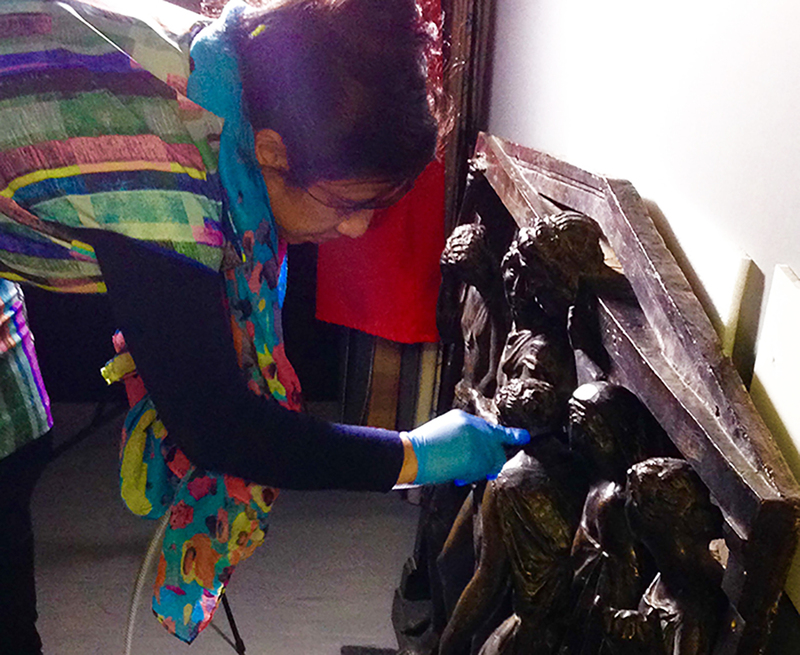 This week Documentation Archivist Mishelle Muagututi’a had the opportunity to appreciate the detail on a bronze plaque that once decorated Wellington’s Majestic Theatre while cleaning it as part of her preservation work. 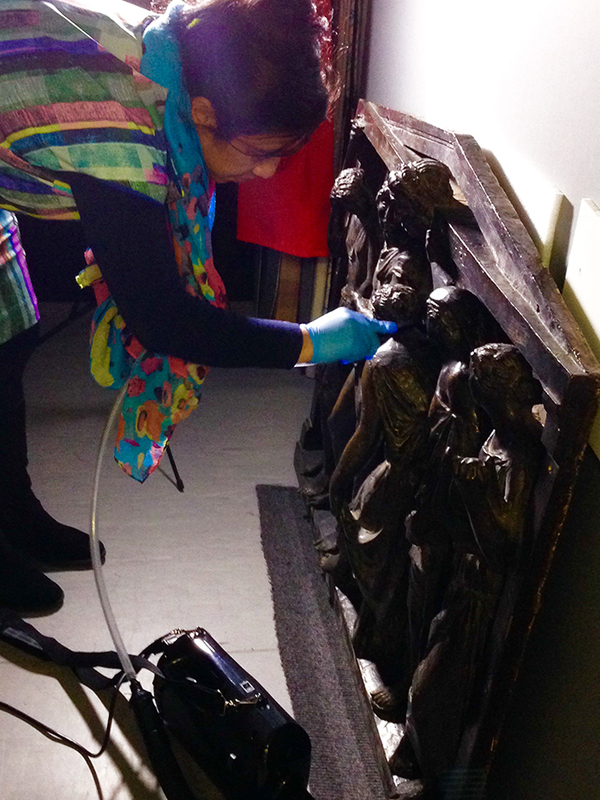 This photograph shows Mishelle cleaning the plaque with a HEPA Filter Vacuum. The HEPA is an archival vacuum cleaner, designed to clean delicately. It comes with a selection of customised heads suited for navigating the forms and crevasses of a range of different types of objects and materials, without causing damage to the item. Mishelle cleaning the plaque with a HEPA filter vacuum. 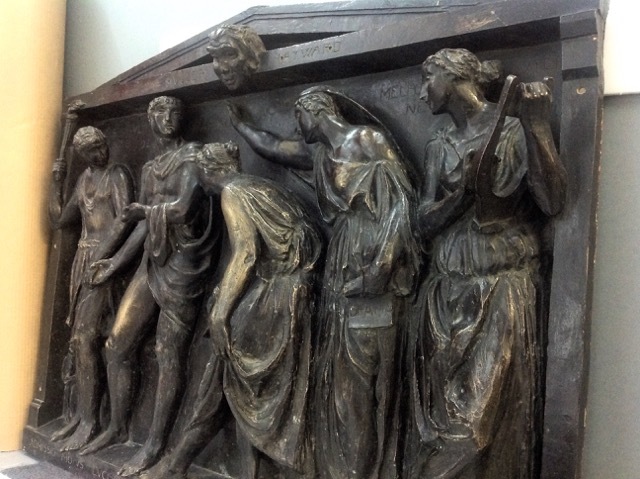 This bronze plaque was part of the lavish decoration of the Majestic Theatre, Wellington, for nearly 60 years. Shortly after the theatre was demolished in 1987 the plaque was deposited to the care of the New Zealand Film Archive (as Ngā Taonga Sound & Vision was then known). In cleaning the plaque, Mishelle’s curiosity was piqued and she carried out some further research into the history behind this item. Some of the things she discovered follow. The plaque is now housed at Ngā Taonga Sound & Vision. The Majestic Theatre, from its opening day on 13 May 1929, was a state of the art venue and certainly lived up to its name. The neo-classical interior of the building started with the double sets of doors to keep Wellington’s notorious breeze from floating through the foyer. The Evening Post writer described the building as “handsome,” and “arisen phoenix-like as it were from the ‘ashes. '” The foyer was of a substantial size, encompassing: the booking stalls, ladies and gentlemen’s cloakrooms, entrance to the tea rooms (which catered for 500 people), and the well-lit passages and stairway up to the picture theatre. The plaque’s depiction of Apollo introducing the new art of cinema to the sisters who represent dance, drama and music was significant at a time when Wellington was a mecca for film distributors. Throughout the 1920s cinema was on the rise, with “talkies” introduced at the end of the decade, coinciding with the Fuller Hayward chain’s opening of the Majestic, their 69th theatre in 1929. 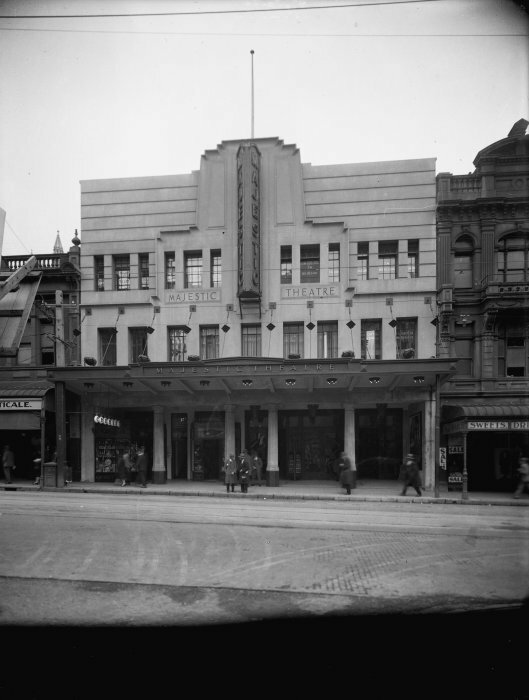 Situated at 100 Willis Street, the Majestic Theatre was built at a cost of 175,000 pounds, and was the second largest cinema in New Zealand (behind Auckland’s Civic Theatre). The first feature to be screened at the opening was the British drama Kitty. 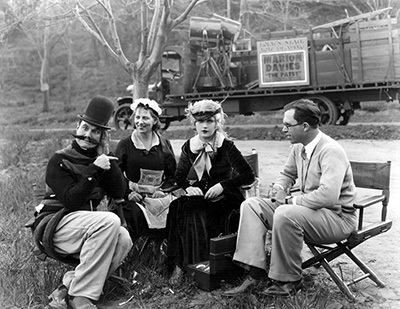 The silent film was accompanied by the Majestic Symphony Orchestra. The Majestic also served as a popular cabaret. 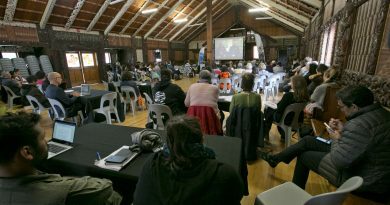 It was the classy centre of Wellington’s dine and dance entertainment industry, and renowned for its glass floor from its opening day through to the 1970s. 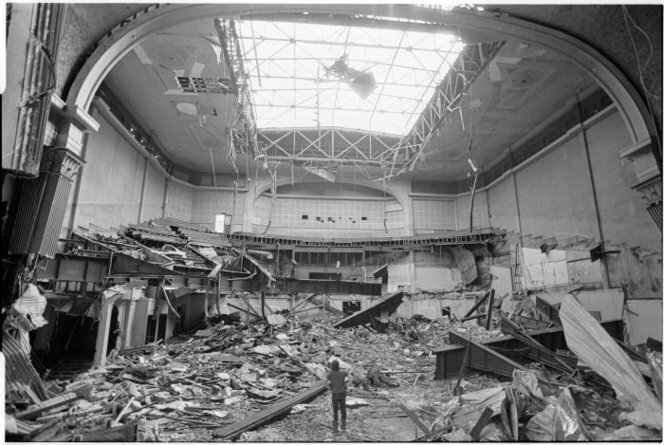 The last film to screen in the theatre was Hercules, on 19 May 1984. There now stands the Majestic Tower, and the carpark basement has elements of the old cabaret. Glancing at this bronze plaque, at the goddesses of Greco-Roman mythology, I smile and think of the many people who walked under their presence into this majestic venue, which hosted many a cinema-goer, dancer, musician, and diner. This bronze plaque, memorabilia, photographs, and a distant memory are all that remain of the Majestic Theatre.